Like Virginia is for lovers, Maryland is for crab cakes. Who doesn’t like nice crab cake sliders to usher in the summer months? Well if you don’t, keep moving…nothing to see here. 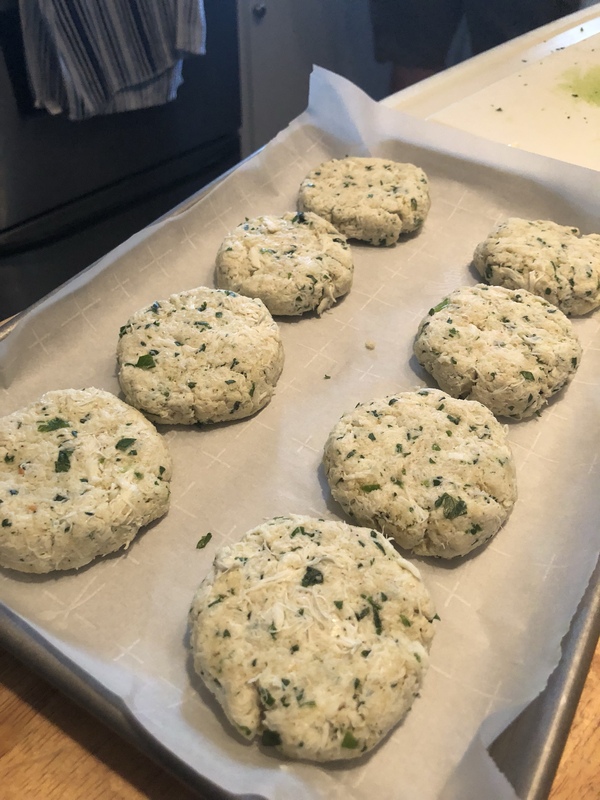 Still, for the sake of our state blog, I felt I needed to give you all a recipe that we have personally made in our house—crab cake sliders. Anyway, these crab cake sliders are a house favorite. 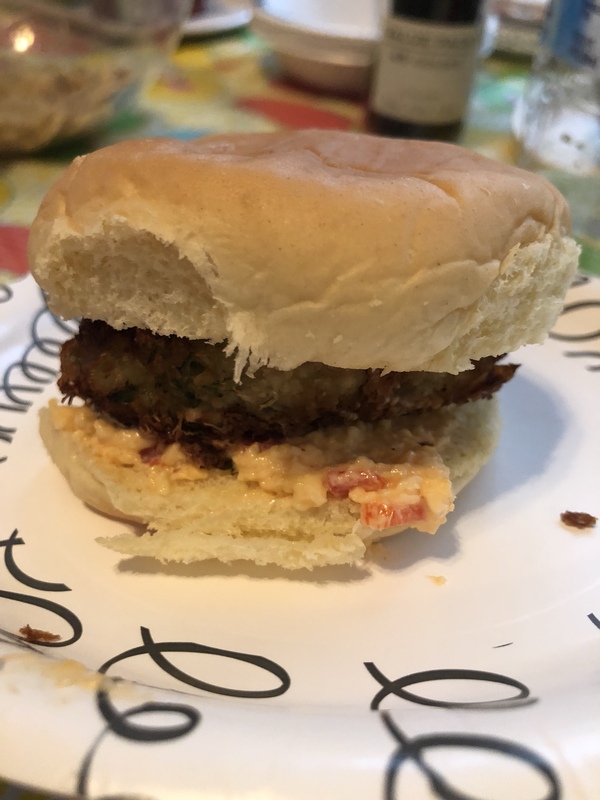 But at any rate, during that class we had some good seafood, including these crab cake sliders with pimento cheese, and I’ve strong armed Hubby into making them several times, including recently, counting as our Maryland meal. By the way, if you are one of those weirdos who don’t like crab, you can use lobster or shrimp. You could probably even use salmon if you don’t like either of those. 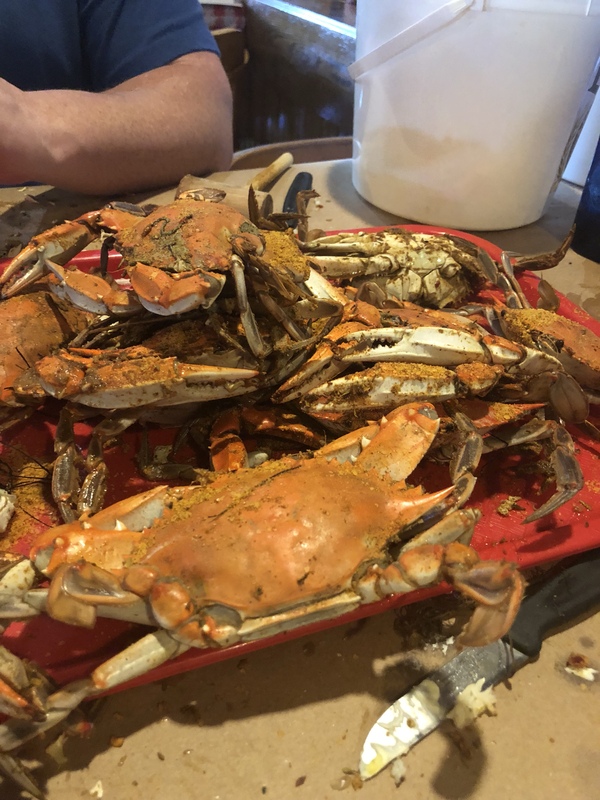 You start off with some lump crab meat. You can either extract it from the crab on your own, or, the much easier way, buy a can of lump crab meat. Just make sure the pieces are coarsely chopped and not too big. If you use shrimp you need to put it in the blender to get the same effect. 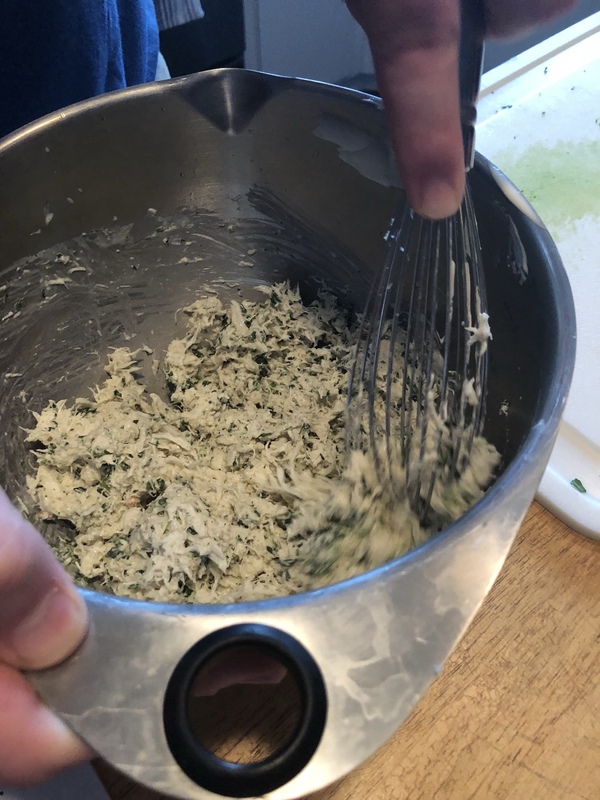 Mix mayo, parsley, lemon juice, dry mustard, salt, and black pepper. (This recipe originally included 2 chopped green onions—I’ve opted to leave them out since I hate them…you do what you want.) Incorporate the crab (or shrimp). Add bread crumbs and fold into mixture. 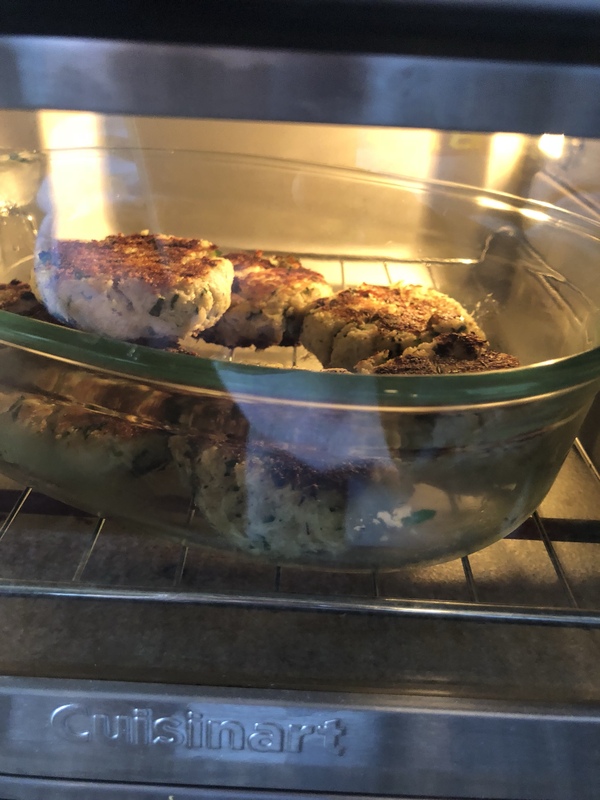 Divide into equal size portions, shape into patties, and place on baking tray. Stick those in the fridge for about a half hour or so to get them to form. 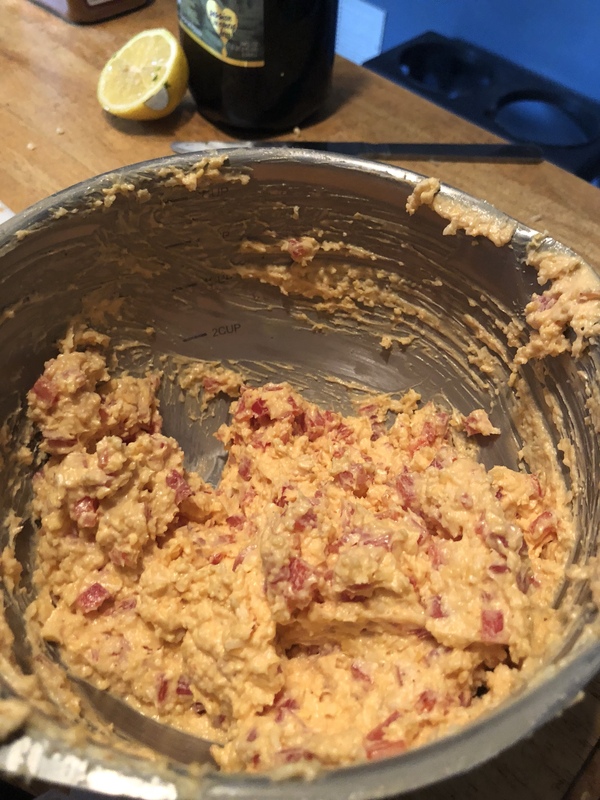 This is when you prep the pimento cheese. By the way, this cheese tastes great spread on Triscuits. It’s so easy to make, too. You combine shredded sharp cheddar cheese, softened cream cheese, black pepper, cayenne pepper, hot sauce, mayo, sugar, and a chopped red pepper, and you are good to go: Refrigerate that while the crab cakes cook. You can cook them on a skillet, or use the air fryer like we did: Bake at 400 degrees until golden brown and then assemble the sliders. Place on slider buns, top with pimento cheese and lettuce, and ENJOY!